On Friday October 28th, 1988, Police Officer David Vasquez was struck and killed by a vehicle at the Intersection of 35th and Date Palm Drive while assisting at the scene of a traffic collision. 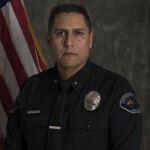 Officer David Vasquez has served with the Cathedral City Police Department since its formation in June 1984. On Saturday March 19th, 2011, Police Officer Jermaine A. Gibson was killed while involved in a vehicle pursuit. His vehicle left the roadway and collided with a tree on South Palm Canyon Drive near Mesquite Ave. in Palm Springs. Officer Gibson was a U.S. Marine veteran and had served with the Cathedral City Police Department for 18 months. To honor the memory of these fallen officers, the Cathedral City Police Department is dedicating a Fallen Officer Memorial at the Cathedral City Civic Center. The event will consist of a formal dedication ceremony by the men and women of the Cathedral City Police Department and will be attended by families and friends of the fallen officers, along with local and regional law enforcement officials and community dignitaries. The community is invited and encouraged to attend this event, made possible by the thoughtful contributions of many groups and individuals. If you attend, parking is available at the Cathedral City Civic Center parking structure, located west of the Police Department. Please see attached flyer for more information.